I’ve been out of Texas and away from Mexican food for a week now and I’m craving chips and dip like you would’t believe. Especially Guacamole. I could eat my own weight in guacamole and chips right now….. Salty, crunchy, tortilla chips. Oh and some Queso would be good too… Mmmm throw in some refried beans and that’s a meal we Texans call Mexi-Dips and Chips. Yum that would be good right now. Yes… I know. I called it Guacamole for two but I show 3 servings. Truth be told depending on the size of the avocados this recipe could actually feed 4 people. But the way we devour it in this house it only feeds two. Is it wrong that I’m perfectly happy making chips and guacamole my dinner? It’s green that means it’s healthy right? 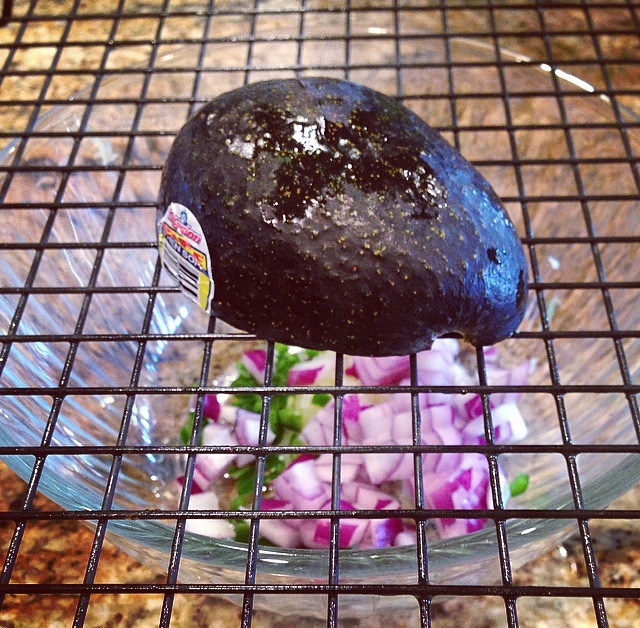 I keep my guacamole simple by adding just a few fresh ingredients…. Avocado, lime juice, red onion, garlic, jalapeño (or a serrano if you like it extra spicy), cilantro, salt, pepper. That’s it, simple, easy, and oh so good. Of course if you like tomatoes add them in but since my husband won’t touch anything with a tomato in it, on it, or near it…. I leave them out. Slice the Avocados in half and remove the pits. Then scoop out the flesh with a spoon or if you have one of those nifty little avocado slicers that works too. Me….I just a wire baking rack to slice and dice my avocados…. 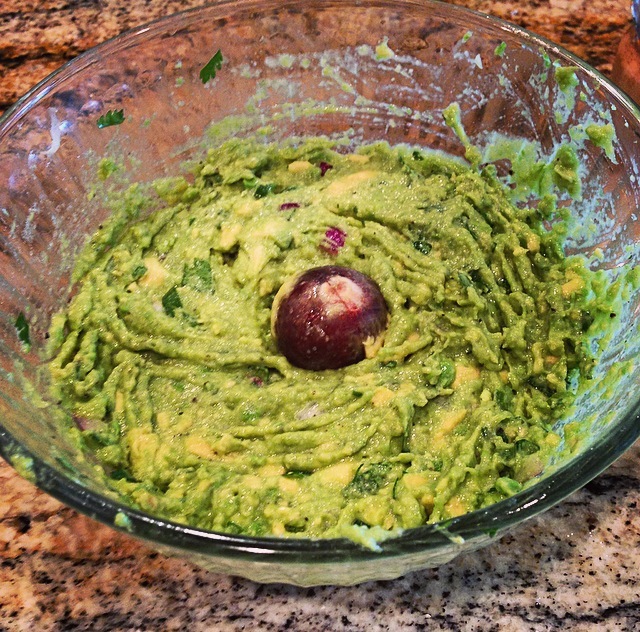 and this works great if you have to make a BIG batch of Guacamole for a party. Add in the lime juice, zest, grated garlic, jalapeño, cilantro, minced red onion, and season with salt and pepper to taste. Mix and mash to desired consistency. Place one or both of the reserved pits in the middle of the guacamole then cover with plastic wrap placed directly over the guacamole (the less air it’s exposed to the greener it will stay). Refrigerate for 1 hour to let the flavors develop. These tortilla bowl shell makers are sold in a set of two and are super easy to use and fairly inexpensive. If you are like me and could live off chips and dip these just might be the perfect bowls for you. These bowls are also great for Taco Salads and I’m pretty sure if you were really creative you could come up with a great deseert to serve in one of these bowls too. Hmmm flour tortilla, cinnamon sugar, vanilla ice cream…..
As I was saying before I got distracted by dessert…. 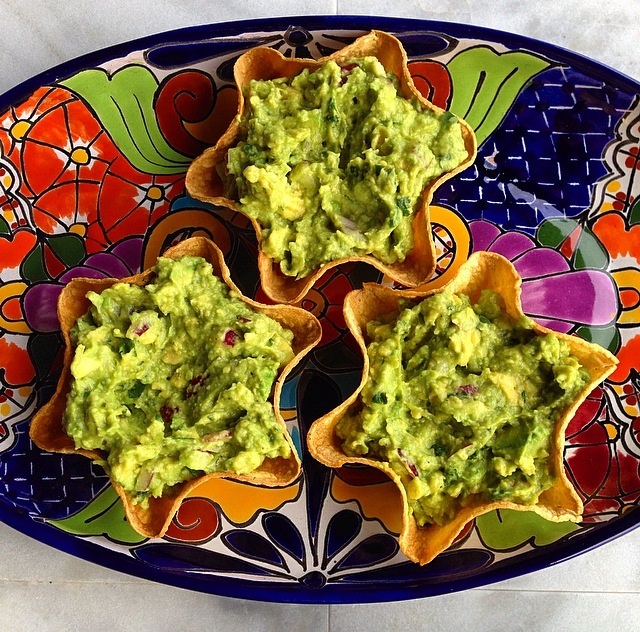 These tortilla shell bowls are super easy and the best part is they are baked not fried. You just place the tortilla in the bowl, brush it with just a little olive oil and bake it for 8-10 minutes until crispy. Now if you have ever lived in Texas (or near Texas) you might have heard of a Fast Food chain called Taco Bueno and you just might recognize this dish. If not then let me introduce you to Mexi-Dips and Chips. 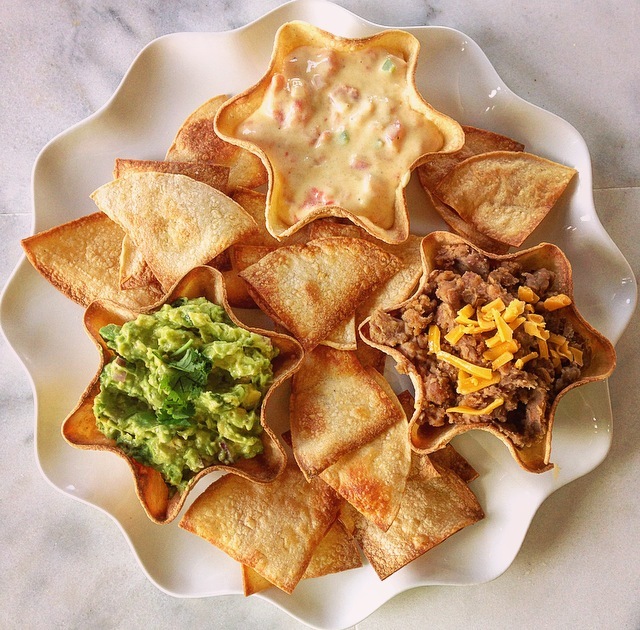 Three corn tortilla bowls holding all your favorites…. Guacamole, Refried Beans, and Queso served on a bed of tortilla chips. For a large portion of my life Taco Bueno was my weakness and this was my favorite thing to order. * I tested several different corn tortillas and I found that Mission brand yellow “extra-thin” corn tortillas crisped up the best and cooked more quickly than white corn tortillas. Wrap the tortillas in a paper towel (or tortilla warmer) and heat in the microwave for 30 seconds until soft. Brush the inside of the tortilla bowl maker with a little extra virgin olive oil then place the tortilla in the pan. Then brush the inside of the tortilla with just a little oil. Bake at 400 degrees for 8-10 minutes. Remove the baked shell from the pan and repeat for desired number of bowls. Then fill with all your favorites like Guacamole, Restaurant Style Queso, and Tex-Mex Refried Beans. 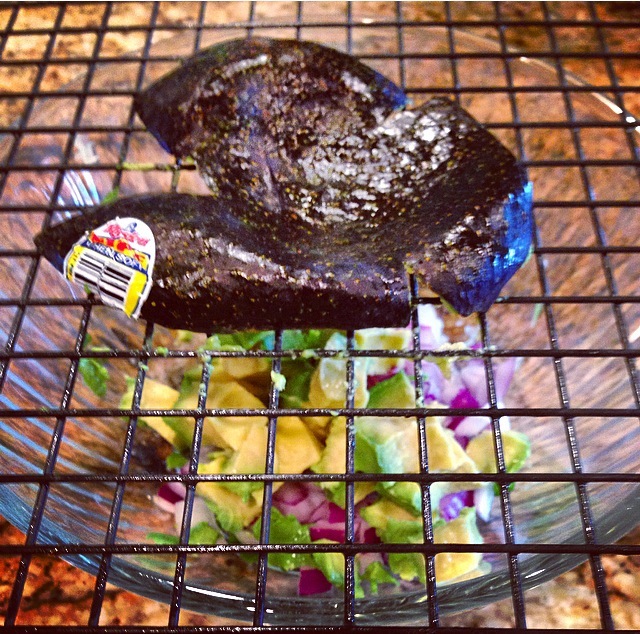 OMG I love your avocado dicing trick! I must do this sometime, that’s awesome! Thanks Kathryn it makes life a little easier plus it’s fun to smash things. Love that diced tip! Why put a pit in it though? I add the lime will try the pit also! Thanks! 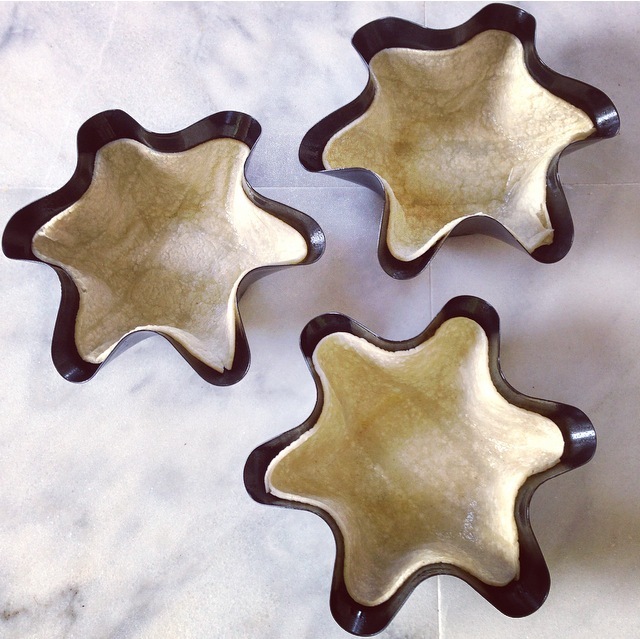 I LOVE your tortilla shell bowls- love how they look but also how much dip they can hold! For me, chips are really the vehicle to eat the dip… I should really use a spoon. 😉 These are really pretty! 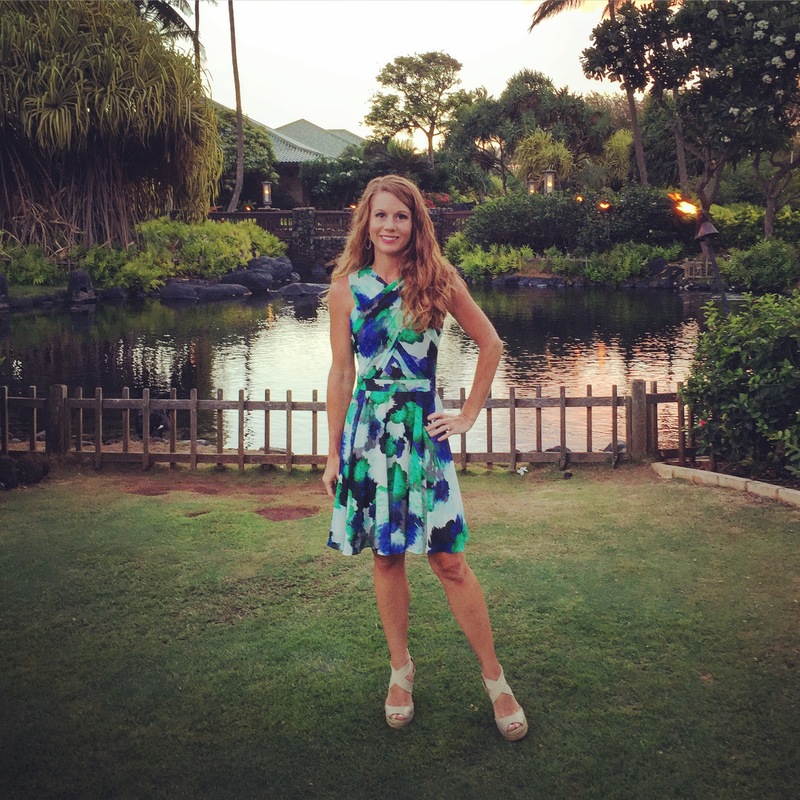 Hey Mel– I am totally with you on missing Mexican food when we are off away from home! When we lived in Spain for several years, I made my own tortillas, refried beans, hot sauce… After a few years one day downtown, I saw Doritos at a fancy grocery store! I couldn’t buy them fast enough (and I’m not really a Doritos fan– but they were so nostalgic!). Fun post. The guacamole looks pretty perfect! 🙂 Love it! You should have opened up your own little restaurant in Spain selling Mexican Food and serving baskets of Doritos. I bet you would have had a line out the door and around the block. Cool idea Mel!! That would have been a lot of fun! !